On Monday night, at the Prudential Center in Newark, New Jersey, the New Jersey Devils wrapped up their home schedule in 2014 with a huge 3-1 victory over the Pittsburgh Penguins. 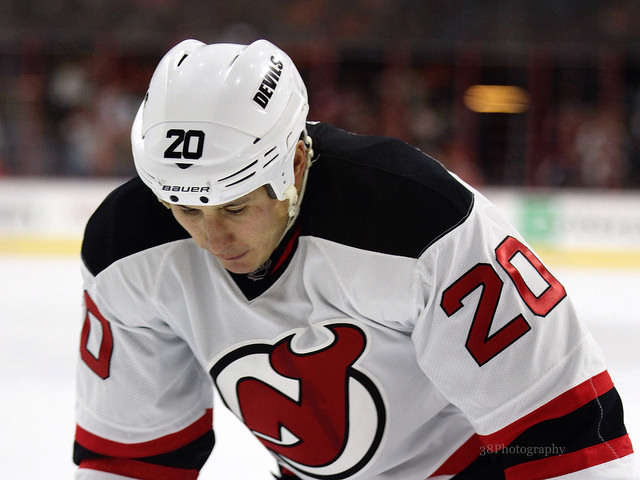 New Jersey, in large part to the play of Jordin Tootoo, literally fought their way to victory tonight. Tootoo got into two fights with Robert Bortuzzo in the second period, which had an obvious effect on the Devils effort. Tootoo said after the Devils last game against the Penguins that he wouldn’t forget the hit, which Bortuzzo had on Jaromir Jagr. He followed up his words with action, and Bortuzzo didn’t back down. “You don’t forget things that happen in the past, when the time was right we engaged, and that was it,” said Tootoo on fighting Bortuzzo. The Penguins took the lead on a ridiculous back-hander from Sidney Crosby, but the Devils shut the door from that point forward. New Jersey’s top-line of Jaromir Jagr, Adam Henrique, and Scott Gomez were lights out for the Devils tonight. Both Jagr and Henrique scored goals, and Gomez has brought an element of speed in which the Devils haven’t had seemingly since he left. His ability to rush the puck up the center of the ice has allowed for Jagr and Henrique more ice to set themselves up for scoring opportunities. Jagr is right about not getting over excited, but this game is a huge positive for New Jersey. The Devils haven’t won on home-ice very much all season going 5-6-5. Beating a team like the Pittsburgh Penguins, who hold the number one spot in the eastern conference is a huge confidence booster, and could maybe be the spark plug to get the Devils on a winning streak. Aside from all the positives, Lou Lamoriello did confirm during his post-game press conference that Stephen Gionta suffered a broken hand blocking a shot during the third period. Gionta will have to see a specialist, and Lou said he doesn’t know how long he will be out for. One has to wonder how many more injuries the Devils can take. New Jersey, along with recalling Joe Whitney, also called up Stefan Matteau who, whether the Devils want to or not, will see action in in their next game against Detroit. At some point though, New Jersey simply has to get healthy if they want any chance at getting back into the race. Players like Patrik Elias and Michael Ryder are trying to recover from the Mumps, Marty Havlat and Jacob Josefson is also ill with a virus and specifically not the Mumps. Salvador has been hurt seemingly forever, Ryane Clowe is still out with I’m assuming a concussion, and rookie Damon Severson fractured his ankle. With Stephen Gionta added to the ever-growing list, New Jersey needs its youth now more than ever. One of the interesting statistics that coming of the game is that nobody on the Devils bench will be officially awarded with the win tonight. Adam Oates, Scott Stevens, and Lou all aren’t considered the head coach of the team. Same thing also went with the loss the other night against the New York Rangers. Cory Schneider was also a big bright spot for the Devils tonight as he stopped 27 of 28 shots in his league-leading 34th start. This win against the Penguins is also the first of his career as he had gone winless (0-4) before tonight. New Jersey will close out 2014 on the road as they will travel to Detroit to play the Red Wings on New Years Eve @ 7:30 P.M.
Like/Dislike? Leave a comment on what you thought about the Devils big victory over the Penguins!